Looking for books about books? Biblio.co.nz hosts hundreds of of the finest online book stores and booksellers, including specialists in books about books. Use the list below to locate a specific specialist bookseller or book store near you. Or, use the form below to search the inventory of all booksellers who specialize in books about books. Store is open by appointment or chance. We are located on the southwest side of Indianapolis, fifteen minutes from downtown, ten minutes from Indianapolis International Airport, and are easily accessible from I-465 and I-70. Member ABAA, ILAB, IOBAAn eclectic mix of good books compiled from 30 years of buying & selling. Sci-Fi, Mystery, Cocktails & Wine, Books About Books, Signed First Editions, Vintage Paperbacks, and many others. Prompt, professional service; always. Photos always available upon request. Four Rivers Books, LLC specializes in fine press books. 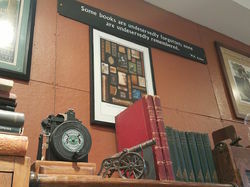 We also carry books about fine printing and private presses, as well as books about books in general. Member of the Antiquarian Booksellers' Association of America (ABAA), the International League of Antiquarian Booksellers (ILAB), and the Rocky Mountain Antiquarian Booksellers Association (RMABA). Hardy Books is a rare and out-of-print book and ephemera seller located in Nevada City, California, in the heart of the California Northern Mines Gold Country. We are part of the "Gold Cities Book Town" which is comprised of Nevada City and Grass Valley, California.We are members of the Independent Online Booksellers Association (IOBA) and follow the IOBA Code of Ethics. Our specialties are Californiana, Western Americana, Books About Books, Fine Press, Original Posters and Movie books, photos and ephemera. Please visit our open shop in the heart of downtown Minneapolis to browse more than 120,000 volumes of quality books in all fields. We also have an extensive inventory of antiquarian prints and maps and more than 30,000 classical and jazz vinyl records. We are an open shop in Ann Arbor,Michigan with over 8,000 books in a variety of fields. We specialize in ancient, medieval, renaissance, and reformation history, books about books, occult topics, and scholarly books. We also do appraisals for estate, insurance, and donation purposes. Fine and rare books in the fields of science, medicine, technology and the applied arts. Old fashioned printed catalogues and lists available on request.A note on binding conservation. All our ancient leather bindings are carefully cleaned with Brecknell's leather soap, and when needed, treated with hydroxypropylcellulose (in the case of dry leather). Finally we protect the leather with \"Cire 213\", the ultimate binding conservation wax developed by the BNF (Biblioth�que nationale de France).